I don’t know about you, but I am always in the mood for mac & cheese. 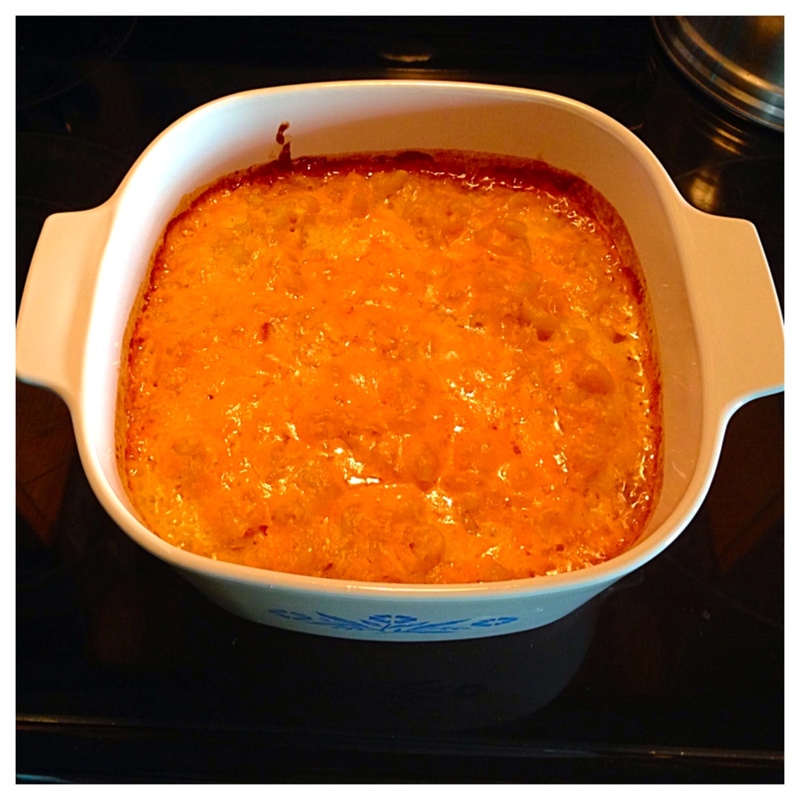 When the days start getting cooler and school stress is getting to an all-time high it’s great to curl up with a comforting bowl of homemade mac & cheese. Usually I don’t have time to whip up a cheesy béchamel sauce, cook noodles, and bake the entire thing to get the wonderful topping. However the recipe I’m about to show you is easier than making mac & cheese from a box (and it tastes better too). 1) Preheat oven to 375 degrees. Now would be the time to grease the baking dish you’ll be using, but I sometimes forget to do this. I don’t find it sticks to my baking dish easily, so if you also forget it’s not the end of the world. 2) If you are using bacon, cook the strips in a skillet and set it aside until it’s easy to handle. Chop the bacon up into bite-size pieces. If you are using another kind of meat that isn’t cooked, now would be the time to cook it and chop it into bite-size pieces as well. 3) Set 1/4 of the gated cheddar cheese aside for later. In a blender, blend the cottage cheese, milk, mustard, cayenne, nutmeg, salt, pepper, and remaining 3/4 of the cheddar cheese together. 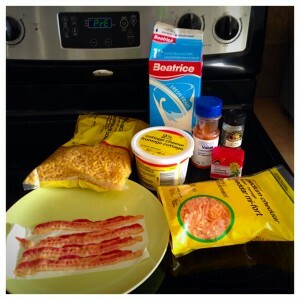 4) In a large bowl, stir the blended cheese mixture, bacon, and uncooked pasta together. If you are adding any veggies to the dish now would be the time to add them in as well. 5) Pour the pasta mixture into the baking dish, cover tightly with foil, and bake for 30 minutes. 6) Remove the foil and stir the hot pasta. Sprinkle the top with the reserved cheddar cheese and dot with butter. 7) Bake uncovered for an additional 30 minutes until it’s golden brown and bubbly. I hope you all like this recipe. It’s really customizable so you can make it as simple or as fancy as you’d like. Have a wonderful start of October! 1) Preheat your oven to 350F. 2) Mix together the flour, baking powder, and salt. 3) In a separate bowl beat the butter on medium speed. 4) Gradually add the sugar (1/4 cup at time) to the butter until all the sugar has been added, then allow to beat for 2 minutes. 5) Beat in the egg whites one at a time and add the vanilla extract. 6) At a low speed alternate adding the flour mixture (1/3 at a time) and the milk (1/2 at a time). Then add the almond extract. 7) Stir in the glacé cherries and spoon batter into the cupcake tin. 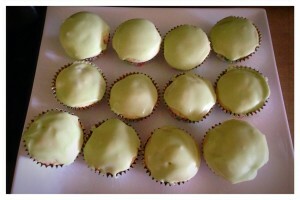 8) Bake for 18 -20 minutes, then allow cakes to cool. 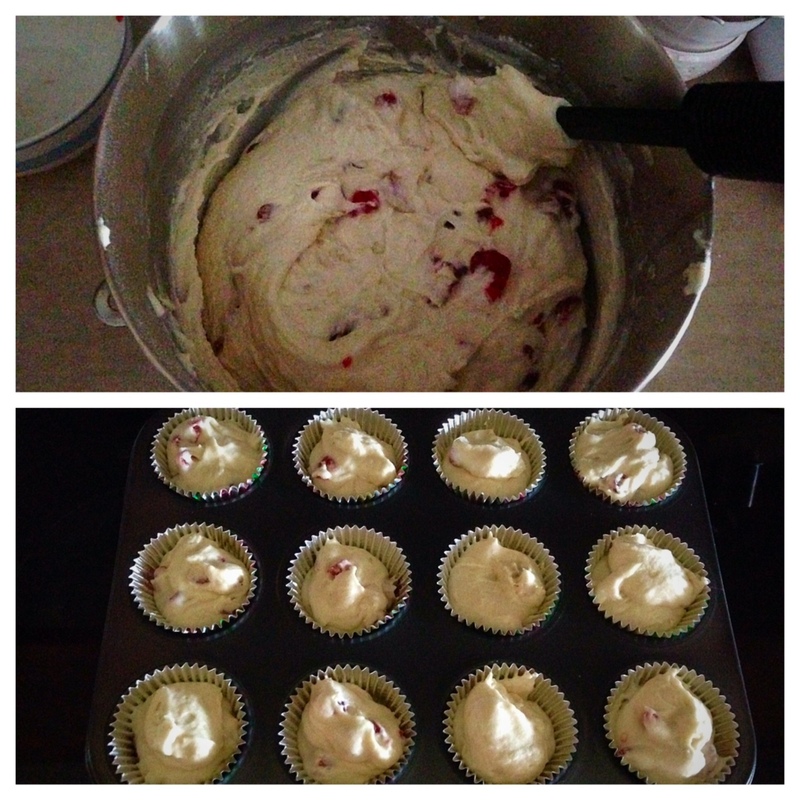 9) Beat all the ingredients for the glaze together until smooth, then glaze cooled cupcakes. I wanted the glaze to be coloured rather than white, so I added a little bit of food colouring to the glaze. 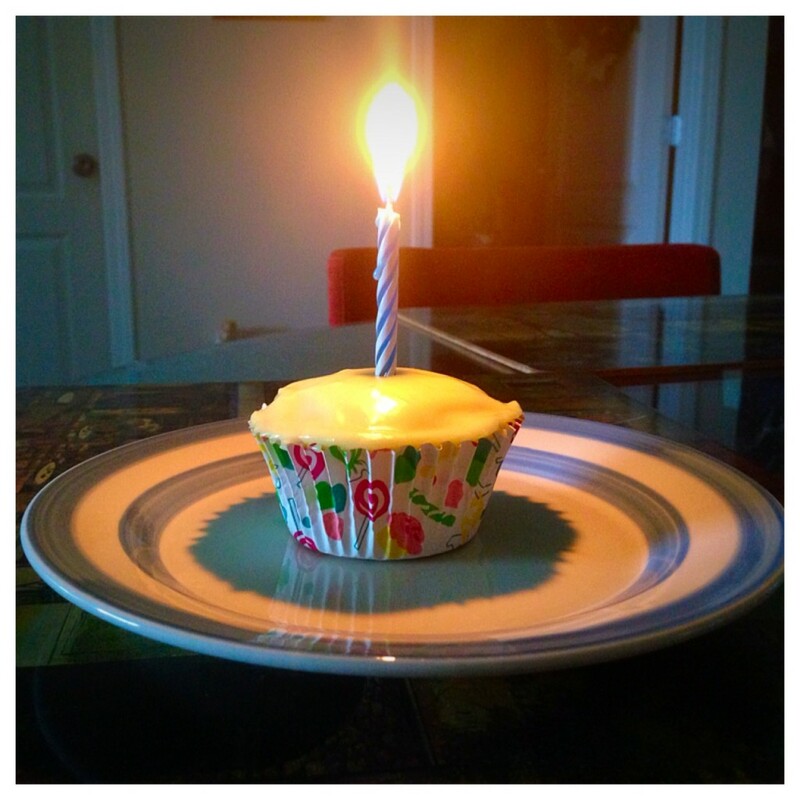 These cupcakes were absolutely delicious! They’re not too sweet and the almond and cherry flavours are just amazing together. This recipe will definitely impress everyone at your next party. Hi everyone! Today I’m going to be sharing one of my favourite go-to cookie recipes. These cookies taste awesome and they are a bit more healthy than standard chocolate chip cookies. I was planning on having more pictures, but I got so excited about making them I almost forgot completely. 2) In a large bowl beat the butter and sugar until creamy. 3) Add applesauce, egg, and vanilla. Beat well until fully combined. Tip: You can use either sweetened or unsweetened apple sauce. I usually use unsweetened, but the sweetened will make your cookies a little sweeter (and a little less healthy tasting). 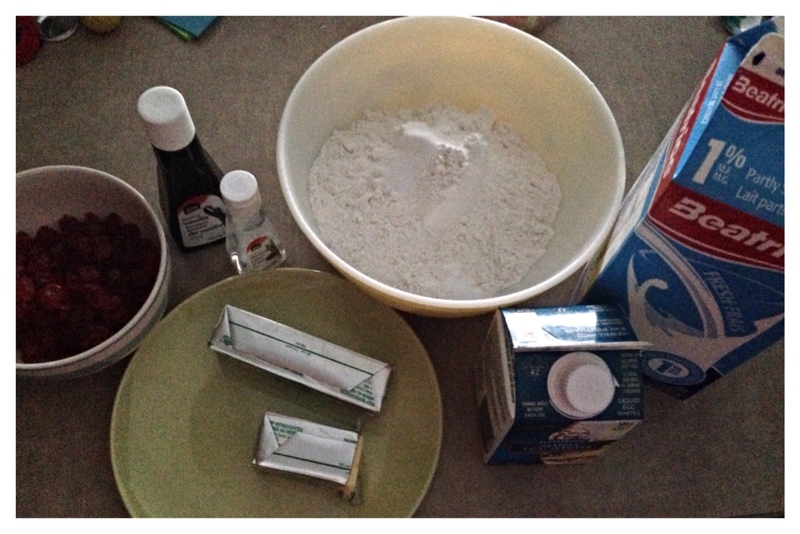 4) In a separate bowl combine the flour, baking soda, cinnamon, and salt. 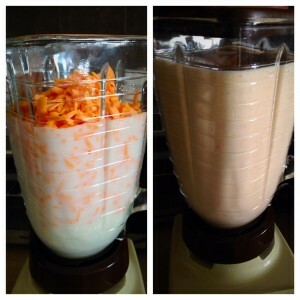 Add this to the apple mixture and mix well. 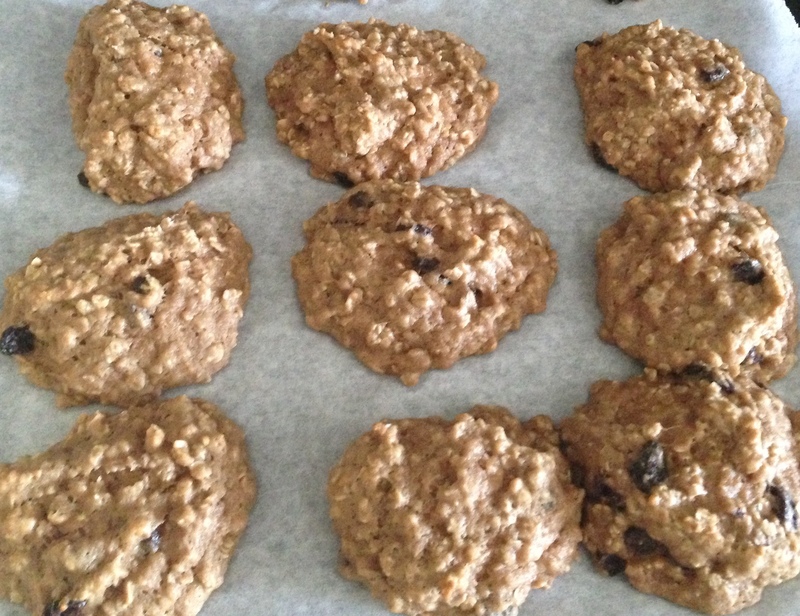 5) Add the oats and raisins. Mix well. 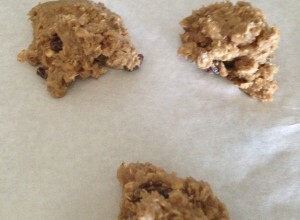 6) Drop rounded tablespoons of dough onto an un-greased cookie sheet. Tip: To save on clean-up I line my baking sheets with parchment paper. 7) Bake 11-13 minutes. Cool on cookie sheet for 2-3 minutes. Remove from sheet and place on a wire rack to cool completely. I hope you all enjoy this recipe as much as I do! Though I don’t always have time for it, I love cooking meals from scratch. There’s something satisfying about creating a wonderfully tasty dish with simple ingredients. 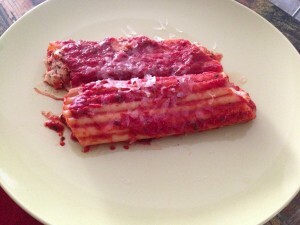 This week I’m going to show you how to make manicotti from scratch. 1) Cook the manicotti shells and run them under cold water when cooked (I usually reduce the suggested cook time by 1-2 minutes to make them easier to work with). 2) Preheat the oven to 350F. Tip: If you are making your own sauce instead, mix the crushed tomatoes with the spices to taste and thin it out with a little water if it’s too thick. You don’t have to use all the spices, and you can switch them out to customize the flavour. I don’t have measurements for this because I just eyeball the amount and taste it as I go. You don’t need to cook the sauce down because it will get cooked when it goes in the oven. 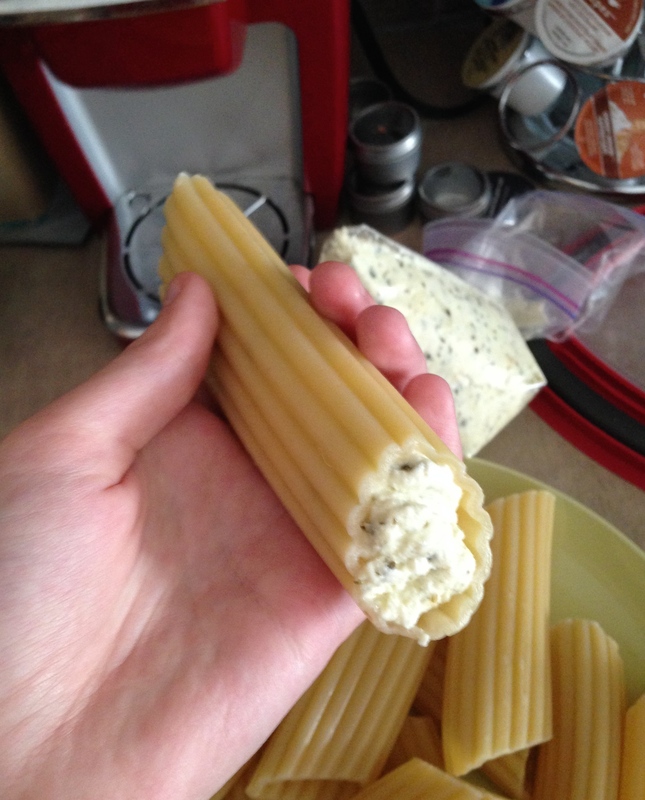 Tip: You don’t need to use pesto in the manicotti. You can leave it out, or substitute it with something else. I find chopped spinach also works quite well in this recipe. 5) Use scissors to cut a corner off the bag (to create a piping bag) and fill the cooked manicotti shells with the cheese mixture. Tip: This may be tricky for the first few times. I find if you hold the shells securely in the middle they are less likely to split open. 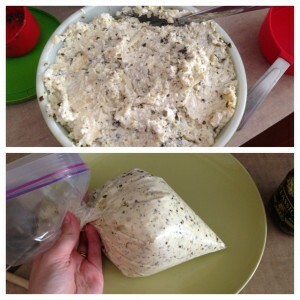 put the corner of the bag into the shell and keep on squeezing until you feel the bag being pushed back by the cheese. Remove the bag while squeezing (until the shell is full on the one side, and repeat on the other side. It does take some practice, but don’t get discouraged! 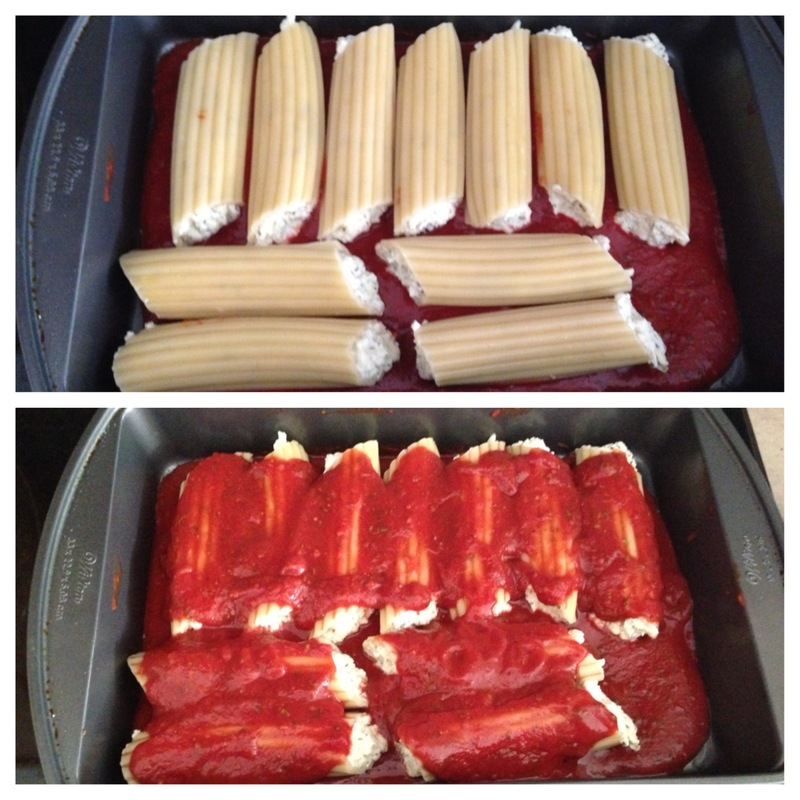 6) Place filled manicotti shells in the baking dish and top with remaining sauce. Make sure the shells are well covered in sauce so they don’t dry out in the oven. 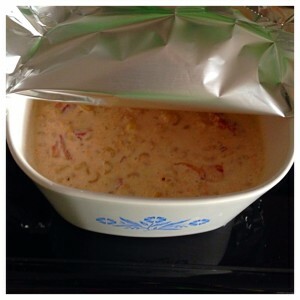 7) Cover with foil and place in the oven for 40 minutes. Enjoy!